A big plus in our enjoyment of The Criterion Collection has been discovering the films by "The Archers," Michael Powell and Emeric Pressburger. Television screenings of Archers films were always rare, and many of them were so "British" that we Americans could only guess at the meaning of certain details. Powell & Pressburger succeeded in making England much more exotic than the image presented in watered-down American pictures. With A Canterbury Tale Criterion brings us what is perhaps the creative team's most experimental movie of the 1940s. What now seems a series of masterpieces were not all initially recognized as such. 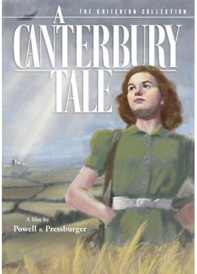 A Canterbury Tale was dismissed by critics, rejected by the English public and eventually drastically re-cut by Michael Powell. Only when restored in the 1980s did it take its place near the top of the Archer's 40s filmography. Centered on the war experience and promoting a fresh look at England as an idea worth fighting for, this odd bucolic mystery film is something of a Pilgrimage: It may require extra effort, but the spiritual reward is especially satisfying. A Canterbury Tale has no special effects and no outright fantastic elements, but Powell and Pressburger suffuse it with a sense of "magic in life." They'd previously made a pair of pure propaganda thrillers for the war effort -- "propaganda" in the positive sense -- and an eccentric look at a satirical cartoon character (The Life and Death of Colonel Blimp) that focused on the friendship between a German and an Englishman. A Canterbury Tale has no movie stars (un-commercial twist #1) and a completely unconventional plot: Three strangers collaborate to unravel a fairly inconsequential mystery and receive 'magical' blessings from the roots of English literature and culture. The closest the film comes to wartime intrigue is a pirate-play battle between groups of local boys. The magic emerges slowly but steadily. The Land Girl Alison is pretty but not a matinee beauty. The American soldier is played with an engaging 'Aw shucks" openness by an amateur actor borrowed from the ranks of GIs waiting to go to France. Unlike American movies from the war years, A Canterbury Tale doesn't pretend that the British are always chipper and obsessed with the need for victory. They're too busy coping with shortages and changes in the workforce -- and in towns like Canterbury, stoically enduring the German bombings. Watching their quiet unity, we feel a strong pull of nostalgia. Was life ever really lived on such a personal and communal level? The Kent locals warmly accept Bob Johnson, a complete cultural stranger. In one of the best scenes, a potentially closed-minded wheelwright strikes up an instant friendship with Bob because they share knowledge of the same craft, woodworking. The movie refuses to generate a phony romance among its young 'Pilgrims' (un-commercial twist #2). It respects its characters by defining them as individuals before telling us their personal problems. (spoiler) Alison is recovering emotionally from the loss of her fiancé in the war, and has poignant memories of a vacation spent in a trailer on the Pilgrim Road. Bob is concerned because he's received no letters from his girlfriend in seven months and is too practical to believe that they've been held up by convoy problems. Peter's 'problem' isn't romantic in nature, and he keeps it to himself. The big mystery is Eric Portman's Thomas Colpeper. He's an ardent conservative traditionalist, yet also attuned to the mystical presence of history that accompanies the ages-old Pilgrim Road. A Canterbury Tale teases us with hints of a serious mystery (un-commercial twist #3) before it settles into its playful rural adventure of discovery, but Colpeper remains slightly mysterious, perhaps even sinister. Powell and Pressburger seem drawn to ambivalent individualists, and Powell's most interesting characters were often his 'villains' - such as Conrad Veidt in The Spy in Black. Colpeper's nocturnal mission to 'chasten' girls who step out with soldiers has a lot in common with the sexually scrambled Mark Lewis of Peeping Tom. We intuit that, if the locals let him, Colpeper would put the town's medieval Dunking Chair back into service. Colpeper has the only romantic role to play, but his desires are eventually frustrated. Initially dismissing Alison as just another thoughtless young woman, he grows closer to her and follows her around Canterbury hoping for an opportunity to declare his affections. Colpeper might think himself similar to the Laird in I Know Where I'm Going!, who boldly presses his attentions on a woman he knows to be engaged to another. But the miracles of Canterbury work against Colpeper. Peter and Bob's wishes are granted in small gestures of hope and self-realization, and Alison receives a world-shattering revelation. Colpeper's miracle is that his crimes will be forgiven. But he'll never win Alison, and must stand to one side as the unusual blessings are given out. A Canterbury Tale is another marvel of Archers storytelling that shows unusual visual restraint -- it's almost naturalistic. Only one moment involving an ironic halo effect recalls the 'magic realism' associated with the arts 'n crafts invention in I Know Where I'm Going! with its smoke-puffing top hats and trains that chug through tartan-covered landscapes. The movie begins with a wonderful Chaucerian prologue, aided greatly by Allan Gray's magical music. It segues to 1944 in a way that predicts Stanley Kubrick in 2001: A Space Odyssey. Across a jump cut, a 13th century falcon becomes a wartime Spitfire. A Canterbury Tale is remarkable in that its propaganda message is so delicate, England's own critics failed to appreciate it. Powell himself considered the film a failure and re-cut it, adding actress Kim Hunter in new scenes as Bob's previously unseen girlfriend. 1 Other wartime fare offered escapist adventure or hyper-dramatic stories lauding sacrifice and home-front ethics. A Canterbury Tale doesn't pretend that people become insufferably virtuous in wartime. It demonstrates for British citizens and soldiers why their country's traditions and culture are worth fighting for, without overstating the case. It's the only wartime movie I've seen that earns the right to end with the hymn "Onward Christian Soldiers." Criterion's 2-disc presentation of A Canterbury Tale gives us a sharp and clean transfer of the restored version (125 minutes versus 95) with excellent audio. The movie has many light scratches and other marks that for visual quality put it a half-notch lower than the average Criterion -- I assume that the scratches in the remarkable falcon/Spitfire scene are un-removable. Anybody who has seen a Powell/Pressburger film wants to know more about them. Karen Stetler, the producer responsible for all of Criterion's Archers discs, gives this presentation some of the charm of her I Know Where I'm Going! extras. That title now brings as many converts to the Archers' hearth as The Red Shoes once did. Sheila Sim appears in a relaxed interview talking about the experience of filming 60 years ago. As with many actors who were in great pictures at a young age, Ms. Sim marvels at how little she understood of what was going on. Apparently there were other "Land Girl" wartime movies but it's still surprising to see Alison walking into Canterbury on a holiday wearing work pants and other country gear, instead of one of her city dresses. A short film by Nick Burton and Eddie McMillan includes a 2001 interview with actor Sergeant John Sweet, who eventually returned to teaching in the states. He exudes wisdom and charm and is fundamentally the character in the movie. Sweet characterizes himself while filming as too self-directed and preoccupied to take in the wonders of England, and then wisely says that's exactly how one is supposed to be when one is young. David Thompson offers a docu of a walking tour of the film locations. Victor Burgin's impenetrable museum video installation piece Listen to Britain is included, along with its namesake, the original classic Humphrey Jennings wartime short film. A welcome but rather depressing extra shows us the revised opening and closing filmed for the abortive American release, narrated by Raymond Massey. The re-cut creates a bookend flashback showing Sgt. Johnson on vacation with his new wife (Kim Hunter), in New York and in the same café in Canterbury where he received her letters. The narration talks as if the war is still going on, yet Johnson taking his new wife to England is definitely happening after the war: The re-cut presumes that the Allies will be victorious, throwing a film based on hopes and uncertainly completely out of kilter. We should consider ourselves lucky that the British saved the materials to restore the original. As has happened with so many American movies, we could be talking about a "lost picture" that nobody alive ever saw. 1. In 1943-44 Kim Hunter, had a stage reputation but was still only a minor actress in American films. Powell's autobiography "sort of" accounts for her presence in retakes for A Canterbury Tale and as the star of A Matter of Life or Death by telling us that Powell was enchanted by the Val Lewton horror film The Seventh Victim. The movie so impressed him that he bicycled the only print in wartime England across London to show it to Carol Reed! 2. Mr. Christie points out a serendipitous fact. Actor Esmond Knight continued to work in movies after being blinded as a sailor on the Prince of Wales during its battle with the Bismarck. Knight played sighted small parts and was accepted as a sighted actor. He actually got a role in 1960's Sink the Bismarck! ... playing the commander of the Prince of Wales!